Special Use Areas are a way of identifying areas in your landscape that require special attention. Whether considered or not, there are areas can be either public or private and serve specific purposes or be used for specific tasks. Most often seen by passers-by and guests, these landscaped areas are referred to as the public area. This would include the front yard, driveway, walkways, and main entrance to the house. These areas need to be not only attractive year round, but they also need to be functional and safe. Surfaces need to be easy to walk across in all kinds of weather. They should not include items that might trip someone unfamiliar with your property. Don't rely on outdoor lighting to reduce this problem. While steps can't always be avoided, unusual spacing of steps can. Keep surfaces that don't become slippery when wet and are easy to remove snow and ice from without destroying the surface. Where do guests enter the house? If they currently come in through the garage and utility room, concentrate on redirecting them to the front door. This can be accomplished with several landscape features. The goal is to highlight the front entrance so it's clear that this is the place to go to gain entry to the house. 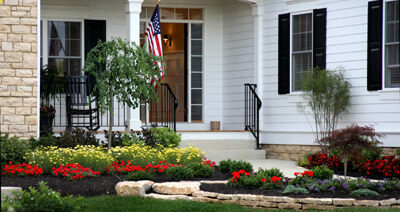 You don't want to plant specimen plants that will dwarf the front entry and hide it. The plants should draw imaginary lines to the front entry so a visitor, without being aware of it, is drawn to that front door. Consider the width of the front walk. A minimum of 4' is comfortable for 2 people walking together. The front entrance can be enhanced by an interesting walkway with surface textures such as brick, slate, or aggregate concrete. Effective outdoor lighting helps direct visitors after dark. Add a focal point to the entrance area. An interesting tree underplanted with a ground cover, or a planter with a specimen shrub might be considered. Low, indirect lighting also helps create a focal point at night. Don't limit yourself to trees, shrubs, and grass to create interesting landscape areas. Include vehicles as well as people in your plan. If off-street parking is needed to accommodate additional cars, consider locating these spaces where they are easily accessible. Parking should be incorporated into the design. If your area requires recreational vehicles to be hidden from view, consider various ways of accomplishing this now. 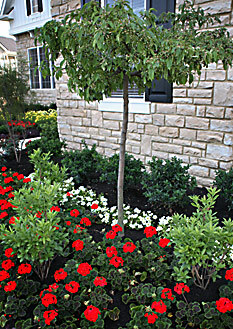 Foundation plantings are the first feature most homeowners think of when thinking about landscaping. Many home foundations are over planted. 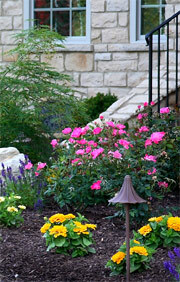 Choosing and placing foundation plants is one of the most important landscape concerns. Always in the public eye, foundation plants greet visitors, add dimension to the area, and when properly chosen, accentuate architectural features. Foundation plantings are often installed according to the old formula: big ones on the end and little ones in the middle. This approach is not completely wrong, but other criteria should be consider as well. This formula funnels attention to the entrance. The result often has shrubs that quickly become overgrown and troublesome near the front door. They looked ok when planted, but in time become much too large for the site and intended purpose. This theory assumes the house must be surrounded by plants to conceal ugly structural foundations that were common in the past. New residential architecture normally does not need this screening. Consider size, color, texture, and number of plants needed to direct visitors to the entrance and accentuate the architectural lines of the house. Quality plants are most important. Instead of planting with small too many small shrubs (1-gallon containers) to give an effect of instant maturity, use fewer plants, but of specimen size and character. A few well-placed specimen plants is more impressive than a row of small ones. Choose a location that enhances individual character of a plant. As it matures the plant will get better without major maintenance. A small ornamental tree is frequently located as close as 5' — 6' from the foundation. Good choices are dogwood, redbud, Japanese maple, crape myrtle, star magnolia, and sourwood. Tree form evergreen shrubs are also useful, such as waxmyrtle, burford holly, ligustrum, or cherry laurel. Incorporate masses of ground covers or mulched areas to create interesting lines. Quality, not quantity, enhances the landscape. Refer to the needs identified in Assessing Family Needs when designing family areas. What are your needs and wants? 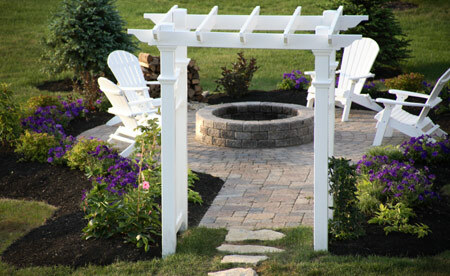 Use the landscape design to create private areas with attractive views from your patio or terrace. 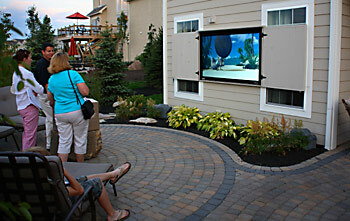 Outdoor living areas should be easily accessible to living and kitchen areas. Decks, patios, and terraces should be an integral part of the residential landscape. Various construction materials are available for these projects. Use pressure-treated wood for decks and screening walls. Even better are some of the new recycled planking that is made from recycled plastics and never need maintenance. They are more expensive to purchase and install however, but the results are long lasting and remain looking good much longer than today's wood products. Brick and aggregate concrete make excellent terraces and patios. Hot tubs, container plants, raised beds, water features, and sculptures can all be combined into inviting outdoor living spaces. Recreation and sports areas are naturally a part of family activity areas. 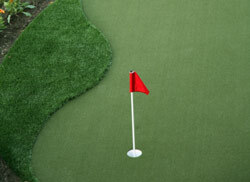 Some families enjoy sports such as tennis or swimming that require special planning. If you may someday add a tennis court or swimming pool to your site, leave enough space without destroying already installed materials. Allow for access by heavy equipment if you plan to add these large items later. Small children should also be considered. Sandboxes, swing sets, playhouses, and toys to be located in the family activity area. Consider what happens when these items are removed when the children get too old to play in the sandbox. Also consider local zoning codes that may regulate placement of large play sets. Residential landscapes requires areas to store lawn mowers, gardening equipment, garbage cans, firewood, bicycles, and other items. Set aside a certain amount of space for these necessities. Provide space for an easily accessible outside utility building. Again check local zoning codes that may regulate placement and size of utility buildings. If possible, keep the back of your site accessible to vehicles. You may need to have a tree removed or a concrete patio installed requiring larger vehicles to access the property from the front. Serious gardeners may want to consider greenhouses or beds for vegetables and cut flowers. Compost piles should go here. If unsightly utility areas are visible from your house or patio, a screening wall or hedge may be needed. Don't forget to screen off unsightly areas from the neighbors. Is your entrance adequately accented? Is your house number easily seen? Do visitors enter where you want them to? Does the walkway attract attention? Is the house over planted with shrubs? Have you considered small trees and ground covers? Do foundation plants vary in texture, form, size, and color? Would a patio, deck, or terrace be helpful? Are hedges or screening walls needed to provide privacy? Do you need a children's play area? Is the area easily accessible? Will it accommodate all the equipment to be stored? Is the garden area located where it will receive maximum sunlight and have good drainage? The final phase of the landscape design is the construction and installation of the hardscape, landscape materials and plantings.